But unfortunately, turning off/on the power doesn't help, and it fails to connect to the target. I've added 10k pull-up resistors to both BKGD and RESET lines; but no success! The same error occurs and it fails to connect to the target. I try to turn off/on using either the main power supply, power jumpers, reset switch, etc. ; but it doesn't matter; again no success! I checked the pins on the pcb, and everything seems OK. I mean, it seems that it has been soldered without any significant problems. I monitored both BKGD and RESET pins: some activities (going from low to high, and high to low) are monitored after I press the "erase" button on CodeWarrior IDE. I tried to monitor the external 32 kHz and 32 MHz crystal resonators, using a 10x probe, with both an analog oscillator and a digital counter. However, no activity is observed, nothing at all! It seems that either the crystals or the respective internal circuits are dead! The datasheet mentions that "the MCU has an internal crystal oscillator, which is enabled in every power-on-reset, without need for external components". What I understand from this part, is that the program/debug/erase step should be done without need for external crystals. This could mean that even if both of the external crystals are dead, I should theoretically be able to erase the MCU with the help of the internal oscillator. But I don't understand why it fails! I tried to program/debug/erase this IC using another version of CodeWarrior, such as 6.3, and also on another operating system, such as Win XP, or Win7 32-bit. But again no success!! The same error occurs, and it fails to connect to the target. There's another circuit board which uses the same MC12311 IC with almost the same components, configurations, and schematic. I tried all the mentioned steps on that board. But unfortunately, no success again! The same errors and the same failures! I checked the power: I provide 5-6 volt external power supply; it passes through a 3v3 regulator; then it passes through a schottky diode, and the final regulated 3.1 volt powers the IC. It is mentioned in the datasheet that the accepted input voltage range is approximately 2.5 ~ 3.7. So I don't think this "3.1 volt" would cause any problems. I really don't know what to do next to solve this challenging problem! What should I do? I would be really grateful if you give any helpful comments or replies. Thanks a billion for your time. To be certain that the pins are soldered to the board correctly you would need to check the existence of the internal diodes. So with a series resistor, apply a slowly decreasing voltage to the pin relative to Vss. You should see the current start to increase at ~0.5 to 0.6V as the diode turns on. If there is no increase then the part is likely not soldered down completely. With this type of package it is difficult to truly check the continuity of the conection as it is difficult to tprobe the actal package pad without also touching the PCB. With the large flags uners the package if there is too much solder paste applied the package can "float" and not make good contact. Do not apply a voltage less than -1V with the series resistor and use a value of ~50k to limit the current. You had mentioned that you had checked the adjacent pins and they were shorted to each other. That does likely prove that there are no solder shorts, also shown by the reset and BKGD lines swinging from VSS and VDD. I am more interested in an open here and this is difficult to test unless you perform something similar to what I suggested above here. Just to answer a few other questions you had. 1) The external oscillator for the MCU will not turn on until you enable it by software so until you have connected the debugger and downloaded code this oscillator will not operate. The part will run from its internal oscillator by default. 2) In the case of a blank flash, after powering on the device the part will jump to the reset vector and try and execute the code that exists in the flash. The value of a blank flash is 0xFF in all locations. This is a valid op-code and the MCU will then try and execute this code of all Fs. this will ultimately result in a device reset, pulling the RESET pin low, due to a COP timeout, or illegal op-code or illegal address. So it is normal to see the reset pin toggle when the flash is blank. I wonder why nobody has replied to this question. Could it be the clock problem? I mean, I can't see any activities on either pins of the external crystals. And besides, I don't know how to check if the internal oscillator of the MCU is working properly or not. Does anyone have any idea how to solve this challenging problem? (Vahid sent my mail asking for help, I wouldn't see this otherwise). > I wonder why nobody has replied to this question. Because nobody has a good answer for you most likely. Nobody else may be using that chip, or at least nobody else on these forums. You've done most of what I would have triied, including different board and different computers (non-64-bit OS). I'd suggest testing your pod on an evaluation board for that chip. If that works, monitor all the CPU and debug pins you can get to with an oscilloscope, and then compare all of them with the non-working boards. You should also look for documents on what the debug protocol looks like so you can recognise what it is doing and work out why it is failing. Thank you very much Tom Evans for your response. Actually, as I've mentioned in parts 7 and 8 above, I've tested this on different computers with different operating systems, and also on different boards. But the result is the same on all occasions. Unfortunately, I cannot afford to buy an evaluation board; so I'll probably test the P&E USB multilink universal pod on an HCS08 based MCU to see if it works or not. Besides, I've studied all the documents, application notes, etc. to see how the BDM works, but no success! Thanks anyway for your time and reply. I do really appreciate your help. Can you please confirm the state of the BKGD pin (PTA4) when reset is released (rising edge of RESET) and also at POR? Is BKGD connected to anything else other than the debug connector? Thank you very much Alistair Muir for your reply. I do really appreciate it. First, let me say that both BKGD and RESET pins have external pull-up resistors (10k and 15k, respectively). The RESET pin has also a decoupling (pull-down) capacitor too (1000 pF). Both of these pins are connected only to 6-pin BDM header and the IC itself, and nowhere else. Both the BKGD and RESET pins are "High" after POR (probably due to their pull-up resistors). However, after I press the debug/erase button at CodeWarrior, the BKGD pin goes "Low", and the "power-cycle" dialog appears. I turn off/on the MCU, as the "power-cycle" dialog suggests, and press OK; then the BKGD pin goes "High" again. If I press "Retry", the same procedure happens again: the BKGD pin goes "Low", and the "power-cycle" error occurs! Error: Can not enter background mode . I guess the problem could be related to the internal clock generator (ICG) of the MCU. How should I know if it's working properly? I hope somebody helps me find the solution to this challenging problem. I would bet your device is in reset state for whatever reason, check all reset connections (disconnect all except the BDM pod). Thanks Pavel Sadek for your response. This is actually the main "victim" of the problem, I think !!! But I don't know how to test it. few microseconds to a few milliseconds. loop times long enough to allow a sync command sequence to complete. sequence to establish communications with the part. Understanding the reset behavior of the part is a key to designing a production line programming system. reset pin, there’s an internal pullup resistor that will pull the reset pin high. coordinating an active drive to correspond to this timing would be very difficult. The S08SG family uses an internally generated POR to qualify the state of the BKGD, not the rising edge of RESET. Blank S08 parts will tend to exhibit self asserted reset loops of variable length on initial power up that may prevent a BDM tool from using the sync command sequence to gain control over the target MCU. Allow the RESET line to be passively pulled up and not actively driven by the programming tool. Hold the BKGD pin low. Apply power to VDD while leaving the RESET to be passively pulled high allowing the part to enter active background mode. Do not allow any glitches or noise on the RESET line after this sequence. Have the programming tool perform a sync command sequence to determine the target device’s BDM operating frequency. command sequence and establish a contact with the part. How should I test to see if my device is in a "reset loop" or not? Here is Application Note on " HCS08 SG Family Background Debug Mode Entry " please go throgh it really very useful. Thank you very much Robin S for your reply. Actually, I've already studied this application note in details, as well as others, such as AN3335, AN2497, AN2295, AN3942, AN1744, AN3305, etc. However, there's no success yet. can you remove the Pull-up Register as well as Decoupling Capacitor from BKGD pin. I am also using 8 bit controller (MC9S08RN8), Codewarrior 10.5 and PE micro USB multilink Programmer and for me it's working fine . Please make sure while programming only your programming pin should get power supply, & not other pins of micro controller. Thank you Robin S for your time and support. I do really appreciate it. As I mentioned before, the BKGD pin is directly connected to the IC. There's no decoupling capacitor on this pin. Do you mean that I should not supply power to the MCU at all !!? I would be grateful if you add more details on this. Thanks. with this line i mean when you program controller than only your programming pin should get supply voltage not other port pins of micro controller. Thanks Robin S for your reply. What is the reason that the other port pins of the device should not get power supply? Actually in my case micro controller was getting power also on other pin apart from programming pins (Reset,BKGD, VDD & VSS), than i also encounter the same Problem as you mentioned above in "POWER CYCLE DIALOGUE" picture.For programming you have to give external power supply to the controller programming pins (Reset,BKGD, VDD & VSS), cause as far as i know about PE micro programmer doesn't give power supply to controller. Today I confirmed no issues in communicating with a standalone S08QE8 device using Codewarrior 10.5 and a P&E USB Multilink. I simply created a new bareboard project with just minimal initialization code, so it just has an endless for loop that sevices the COP. Using this I was able to connect and program flash. I am not sure what kind of project you have created but you may want to try duplicating this on your board. Make sure that the debug configuration for the project is selecting the right debug interface (P&E universal multilink in your case). Are you able to confirm the part is truly soldered to the board correctly? can you "curve trace" the pins relative to Vss to check you see the ESD diodes and make sure there is a good connection to the board? When you are trying to commmunicate with the debugger is RESET getting pulle all the way to Vdd and is the BKGD pin swinging feom Vss to Vdd? Thank you very much Alistair Muir for your support. I do really appreciate it. Today I confirmed no issues in communicating with a standalone S08QE8 device using Codewarrior 10.5 and a P&E USB Multilink. I simply created a new bareboard project with just minimal initialization code, so it just has an endless for loop that sevices the COP. Using this I was able to connect and program flash. 1. Would you please provide the schematic of this simple circuit? I just want to make sure about the connections. Thank you. 2. I'll try to monitor the pins using a simple "octopus" circuit and an oscilloscope as "curve tracer". But just one question: Do you mean I check the pins of the IC relative to the VSS, so as to check the internal diodes of the IC? Or you mean to test the external components on the board? As I mentioned before, when I press the debug button, the BKGD pin goes from VDD to VSS; but after the connection error and failure, it gets released to VDD again. 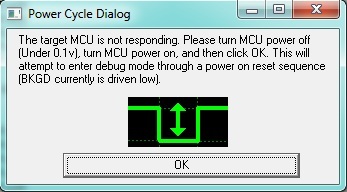 The RESET pin is pulled-up to VDD with a 15k resistor, so it remains high, except when the "power-cycle" dialog asks to manually turn off/on the MCU. Thanks a billion for your support. I look forward to hearing more from you. Thank you very much Alistair Muir for your reply. I didn't see any sign of diode-like activities on some of the port pins (almost 7-10 ones). Is this normal? Which pins of the MC12311 do not have internal diodes? I checked the pins of the MC12311 on two different boards. Surprisingly, 7 respective pins resulted differently in both devices. For example, PTA6 had internal diode (0.7 volt) in one device, but not on the other one!! Is this normal!? What does this mean? What should I do now? Any other suggestions? All the port pins (PTxy), except PTA5, have doides to both Vss and Vdd. PTA5 will just have a diode to Vss. If these pins have been soldered correctly then you will see a diode to Vss. If you are not seeing a diode then it suggests the pin is not properly soldered to the board. The fact that the pins you don't see a diode on change between boards also suggests that there is a soldering problem. How were the units soldered to the board? Did you use solder/solder paste under the two flags of the package? Thanks again dear Alistair Muir for your great support. Actually, the device has been soldered by someone who is professional in soldering. It has been soldered (probably) using solder-paste and hot-air technique. We tested the internal diodes using a digital multimeter in "diode-test" mode: We connected the negative probe to VDD, and the positive probe to the pins of the device (so as to test the internal pull-up diodes which are connected to VDD internally). This way, we monitored 0.7 volt on most of the port pins, but not all of them. Is this a correct method of testing? Or should we only use the "sweep" method, as you described above? With these results, it seems that the problem (with both boards) is either "bad soldering" , or even worse, "corrupted IC". How should I know which one is the case? Is there any method to test if the blank IC is corrupted or not (besides programming or erasing methods, of course) !? Thank you very much for your time and great help. I do really appreciate it. I look hopefully forward to hearing from you. While it is certainly possible to hand solder a device like this it is not recommended. It requires a signficant amount of heat to get the device and board hot enough to re-flow the solder under the part and you do run the risk over damaging the device if too much heat is applied. 1) Simply try re-flowing the device (as mentioned above, if this is done by hand there is the risk of damaging the device. 2) Mount a fresh device to a new board and do not put any solder paste on the 2 flags under the device. This may not be ideal for RF performance but you have a better chance of having all the pins soldered down correctly. This would then allow you to confirm the connection and operation of the debugger. 3) Connect the minimum number of signals to a bare device. So do not mount it to a baord but simply solder the necessary small wires to the individual pads of the device to connect the debugger (this I think has also been suggested below). You will just need Vss, Vdd, RESET and MS/BKGD/PTA4. The other signals can be left floating for this test. Bring these out to a 6 pin BDM header and connect 0V and 3.3V and you should then be able to connect to the device. 1) I highly recommend NOT using a multimeter to test for the diodes in anyIC. It can supply a higher than allowed voltage to the device. Always use a controlled method with a variable power supply and a current limiting resistor. 2) I would suspect the issue is hardware. Either the pins are not making good contact or the device has been over-heated. My suggestions above should help prove this. 3) I would suggest connecting the just the necessary wires as described above to access the device with the debugger. Thank you very much Alistair Muir for your detailed and helpful reply. Thanks again for your support. I do really appreciate it. Thank you Pavel Sadek for your great support. I do really appreciate your time and help. I updated the firmware of the P&E USB Multilink Universal to the latest version of HCS08 devices. But unfortunately, it didn't help. The same errors occur. I would be grateful if you help me find out what the problem is, and what I should do to solve it. How many of these boards you have? Do you see the problem in all boards? Have you ever download code successfully, and the later it failed? or else, it never worked OK ? If you previously download code to the device, does the code was using Low Power modes? Have you tried re-soldering the device into the board ? The BDM is supposed to take control of the RESET line during the download and debugging processes. Have you tried a different BDM multilink, Is it possible it is damaged? Please refer to manufacturing chapter. I got your emails through LinkedIn. My apologies, I was out of the office during last week. Thanks your patience and understanding. I will follow up this problem until it gets resolved. Thank you very much Alan Led Collins Rivera for your reply. I do really appreciate your time and support. We have designed two boards: one is receiver, and the other is transmitter. The design is based on the schematics available at the MC12311DHRM.pdf file. Unfortunately, this problem occurs on both of these boards. Unfortunately, we have not been able to download any codes to these devices up to now. Actually, we have not been able even to erase them!! The problem is that the P&E USB Multilink Universal programmer fails to connect to the target, as described earlier in this topic. Unfortunately, we can't afford to buy another BDM programmer. However, I don't think this is the problem either. Because as illustrated in my previous post, the P&E programmer sends commands via BKGD and RESET pins, successfully. I just don't know if these patterns are correct or not. 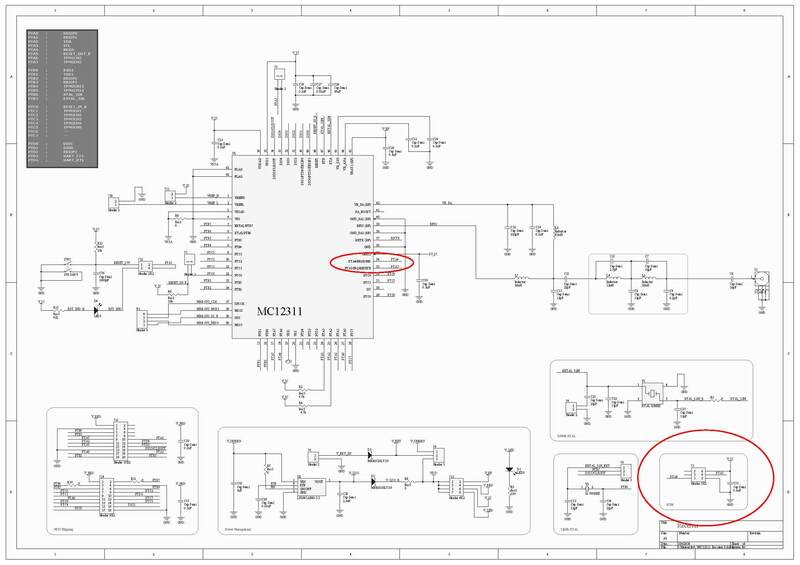 As mentioned earlier, we have designed the boards according to the schematics and recommendations available at the MC12311DHRM.pdf file. Is it possible that the device is in a "reset loop", so that it prevents the connection? If yes, what should I do to solve it? I don't see any activities on the external 32.768 kHz and 32 MHz crystals. Is this normal when the device is blank? Are there any other softwares specifically designed for MC12311, such as Beekit? Is it possible to erase the MC12311 using Beekit? Thanks again for your time, support, and great help. your device has BKGD pin tied to high level once exitting the reset, it needs to be low . AN2497: In the reset method, the RESET pin is released after the BKGD and RESET pins are pulled low, and then the BKGD pin is released. Well in all cases you need to go through the Power on Cycle. If single power cycle does not help, do another one or start the debugger and apply the voltage after that. So give it a try with my project, once the device is programmed, you should not observe the failing condition. Thank you very much Pavel Sadek for your great help. That's nice of you. I do really really appreciate it. 1. your device has BKGD pin tied to high level once exitting the reset, it needs to be low . Actually, as illustrated in the following picture, the BKGD is held low, while power cycling the device. Please correct me if I'm wrong. Did you mean something else? 2. So give it a try with my project, once the device is programmed, you should not observe the failing condition. I will definitely check it with your attached project, as soon as possible. I'll let you know about the result. Thank you. Thanks again for your time and great support. another reset should be created by the multilink (pin reset only), its timing is some 10us on my screen and the state of BKGD pin after this one is importatnt for you. As stated in AN2497 it needs to release reset first and then bkgd to high to get into BDM. you can force the device to BDM after first reset (POR) by holding BKGD pin low. Most likely the device was in BDM state once Reset went up on your screen. But it was interrupted by multilink as it tried to connect the device by forcing it to bdm its way using the RESET. Thanks again dear Pavel Sadek for your great support. It seems that after 6 cycles of some initial commands on BKGD, three events occur: (1) the BKGD pin goes to low, then (2) a reset occurs on RESET pin (which is very short, perhaps a few micro-seconds, as you illustrated before), and then after the release of the RESET, (3) the BKGD pin goes to high. So I assume that the P&E USB Multilink Universal programmer is working properly. Am I right? Any other suggestions? What should I do now? the pin is driven low. My device on MRB requires just single power cycle prior to new BDM connection when it was mass erased and power on reset was done to disconnect the BDM connection. I would temporarily remove the 1000pF cap from reset line. I know it is recommended for harsh environments but for now I would like to omit it. Thanks again for your great help Pavel Sadek . with and without the pull-up resistors on BKGD and RESET pins. with and without the 1000pF capacitor on RESET pin. with different amounts of pull-up resistors: 1k, 3.3k, 4.7k, 10k. power-cycle in several consecutive times. the above tries in another MC12311-based board. trying to enter to BDM manually. But unfortunately, the result is the same in all the cases! The connections to the target fails. The same errors occurred again, and it failed to connect to the target; however, these strange frequency counts happened. What does it mean? Are these frequencies related to noise (due to the lack of external resistor)? Does it mean that at least the programmer is working properly? You have contacted me thru internal FS email. According to this forum's policies I'm answering you in public. I think Pavel in on the right track. IMHO your problem looks like it's related to the pwr-up reset you need to program a blank part. I suggest you to check all your connections and if possible work on a "master power switch" that could turn off all possible paths. I've experienced "innocent" USB dongles providing enough current thru the clamp diodes to avoid complete powerdown and as a consequence, not entering BDM mode. Thank you very much Celso Monteiro for your reply. I do really appreciate it. Powering off/on only the MCU power, the 3v3 regulators, the whole board's power, etc. But no success !! Also, I've checked this on different computers, either laptop or pc, and also on different OSs; but the same errors occur !! I'm analyzing the whole situation and the things you've already tried thanks to the suggestions from Alistair Muir and Pavel Sadek. I will get back to you today before the end of the day. A new full-erased S08 device coming from factory, requires a power cycle when trying to enter into background mode. The device goes into continuous RESET because the watchdog is enabled by default (using the internal 1kHz clock), and there is no code to disable or feed it. Besides unknown data in the memory could be generating illegal opcode or addressing. So the device needs to go into bakcground mode by having the BKGD pin in low level when the device is powered. This way the BDM multilink takes control of the situation. Do you have MC1231x-MRB evaluation boards? If you are able to program these with the BDM, then it works OK.
Connect the BDM multilink into the BDM port. while the device is still off, hold the RESET line in logic 0. I do this by holding the RESET button in our evaluation boards, looks like you need a different approach. try to download and debug from codewarrior, you will get the power cycle window. Now is the time to release the RESET line and click on retry. This makes the BKGD to be low when the BDM tries to take control. This usually works for me. I hope this solves this specific problem. Another option is the soldering process of the device. There is a suggested soldering profile for devices using RF technologies. If you use more heat than the expected, you may damage the IC. Besides this packaging is not easy to solder. I saw a couple of messaging trying to identify if the soldering process could be the root cause, I will review carefully. I see you are contacting many people directly to their emails. This tells me you are in a hurry to solve this problem, and I understand that. I just want to make sure we are doing our best to solve it on time for your needs. If your business will be negatively affected by not solving this problem immediately, I strongly recommend you to submit a SR in Freescale webpage, please include all the business details. Then send me the SR number to my email, so we can continue this support on a formal support basis. Thank you Alan Led Collins Rivera for your detailed and helpful response. I do really appreciate your support. I didn't fully understand the procedure you described above (to take control of the BKGD). When should I turn the device on again? With the device turned off, how would Codewarrior be able to connect to the target device? Would you please add more details on this procedure? Turn on the device while you continue holding the RESET line in logic 0. Thanks again Alan Led Collins Rivera for your response. I'll try this approach as soon as possible, and report the results here. We tested the above-mentioned approach today, very carefully, paying attention to those steps. However, the same errors occurred again, and it failed to connect to the target. It really made us sad. Any other suggestions to test? I had a conversation with Pavel Sadek, about the RST pin. The MC1231x has the MCU and Radio internally connected. The IRQ and RESET functionality are shared in the same pin. The Radio sends notification to the MCU using the IRQ pin. So the RESET/IRQ pin is internally connected to the Radio. We were wondering if this connection could be causing the problem you are seeing. Could you please try again without powering up the radio? It is pin 43 = VBAT1 (RF) , basically you just need to remove the jumper J13 position 1-2 for V_RF. Thanks again Alan Led Collins Rivera for your support. I have tested this option before, but it doesn't help; the same errors occur. Actually, I have tested placing/removing several different "permutations" of available jumpers on the board !!! But they all give the same errors! Another idea that might sound silly, but it happened to me in the past. If you connect the BDM cable incorrectly, you will always get the Power cycle dialog window, no matter what you do. One time, a peer of mine took my BDM multilink, opened the enclosure, and changed the connection of the cable, so the red line was no longer pin 1. It is funny if you see it from his perspective. I was having trouble for couple of hours until I decided to connect the BDM the other way around. It worked !! Please try this on your side. Thanks again Alan Led Collins Rivera for your helpful comments. 1. How would the BDM Multilink get its power (VCC and GND) and illuminate both its blue and yellow LEDs? 2. How would the BDM Multilink send such accurate signals through BKGD and RESET pins (as illustrated in pictures, several posts above)? Anyway, I'll try this as soon as possible, just to make sure this is the problem or not. Let's isolate the CodeWarrior from the possible root causes. If you have BeeKit installed, you should also have Test Tool 12 software. Open Test Tool 12, use the HCS08 firmware loader to download directly the .s19 file into the MC1231x. I did it on my side using a RAdio Utility .s19 file. I previously erased the memory of my 1231x so I could force the power cycle dialog window. After I power cycle, the download worked just fine. Let me know how it goes on your side. Please try the ideas we gave you today. Tomorrow we will review the outcome, and continue from there. Thank you very much Alan Led Collins Rivera for your great support. I do really appreciate it. I have already tried programming the target device using Codewarrior (in different versions), Test Tool (from BeeKit), and also HCS08 Interactive Programmer (from P&E). But unfortunately, they all have the same errors: cannot connect to the target !! Actually, this probably concludes that our problem is in hardware, not software. Am I right !? Alan, where can I download the MC12311 Radio Utility? By the way, vahid elc86, where are you located? what is your time zone? I am in Mexico, Central Time Zone (CST). Sorry if I repeat someone else (too lazy to read entire thread) but have you considered possibility that the multilink may be at fault? I purchased a multilink for use with HCS08 a while back and it doesn't work. I believe the multilink is at fault because swapping with my Cyclone Max results in connection every time. that is why the issue is not there. I had several times the problem you report with different S08 processors (S08AC32, S08SH8, S08SE8 etc.). I do use P&E USB Multilink, Codewarrior 6.3 and XP. Often simply manually cycling power on/off the application board when requested solved the problem but not always. The status of the device does influence a lot the problem: sometimes it is difficult to program a blank device for the first time but it is easier when already programmed, sometimes it is the exact contrary. I assumed it may depend from the software in flash which caused endless reset by COP or other mechanism. I am also sure that the definition of general I/O ports may influence the BDM initial control when these I/Os are hardware connected with low impedance sources/loads which may cause substantial currents to be sinked/sourced. This is worse when a limited power supply is available which may be influenced by improper loading. For this reason I take a very carefully approach to immediately declare safe status of all I/O in my application board as first step in my firmware with pull-up/pull-down on all logic inputs where not externally present and by presetting correct initial status of outputs which does not conflict with the peripheral circuitry: this resolved many headaches. The second important issue which solved the rest of my problems was to provide a hard power supply connection to Vdd of the uCU capable of supplying peak current in excess of 50-100mA (a 78L05 is enough) at least during device programming. I strongly recommend P&E USB Multilink which I have used for all my S08 designs and production in thousands of boards and many different S08 variety compared to the OBDM which I found much more problematic to use at least with CW6.3. I hope this may be usefull to you too. Good point about source current capabilities!!! Thank you all for your helpful responses to this problem. The problem was actually a soldering issue!! The IC had not been soldered correctly, so almost half of the pins were floating in the air, including the programming pin!! So that was the reason for having problem connecting the programmer to the IC. Special thanks to Pavel Sadek Alistair Muir Alan Led Collins Rivera for your time and support. I do really appreciate your help.